1 – Statistics play a very important role in our day to day lives. They give us insight on research, and a general view of a certain group. 2- Statistics give us a perspective of large groups and a possible view on the future. 3 – People know how to hide bias very well, and it can be hard to determine bias and the information given. 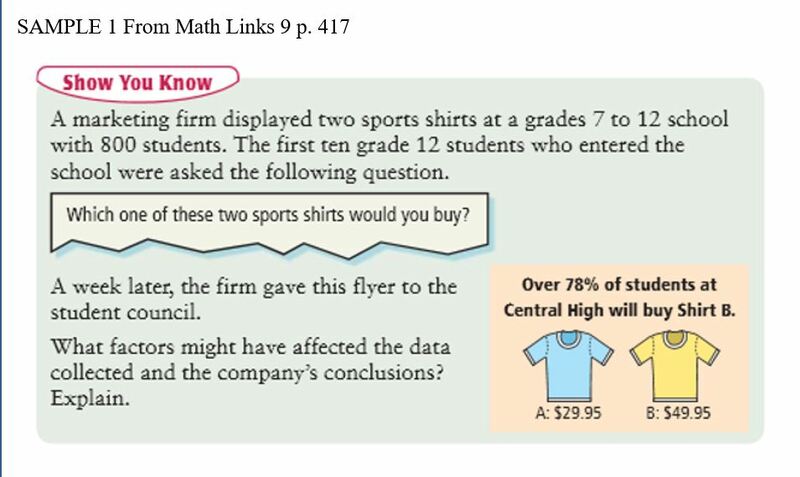 When I first read the article, I thought that it was a great form asking students’ which shirt they would purchase. After learning about influencing factors, I now think there was bias influencing the shirt the students’ would purchase. In the future, when reading and interpreting survey data, I will analyze the question being asked, and the information and product being given. List three things you spend money on each month that would be fixed expenses. List three things you spend money on each month that would be variable expenses. If you needed to save some money, how could you change your spending? If I needed to save some money, I would review my spending on the variable expenses such as clothing, groceries etc. How much money could you save in a month without giving up too much? You can review the spaces where you can easily adjust, then look into cellphone bills, internet bills and other significant expenses. The most noticeable skill I’ve learned this week was the exponent’s different rules. Rule: When multiplying powers with the same base, you add the exponents. This rule is pretty straight forward, you use the base and add up the bases, and use the sum as the exponent for your new multiplied number. 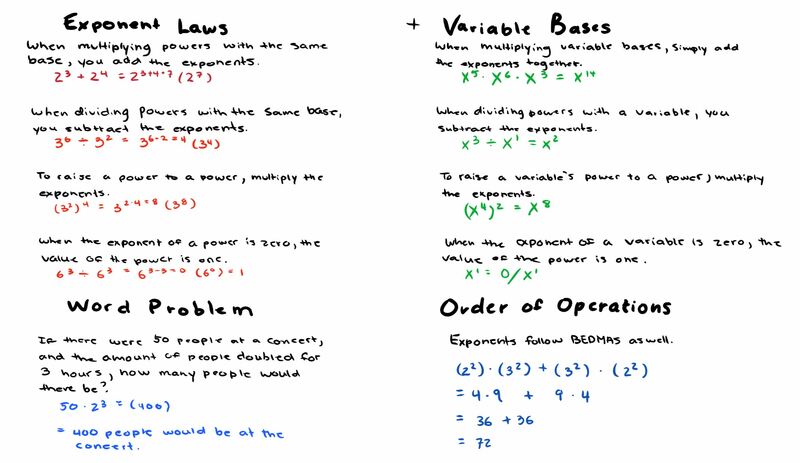 Rule: When dividing powers with the same base, you subtract the exponents. When you’re dividing two exponents with the same base, you subtract the two exponents, keep the same base and add the new exponent. Rule: To raise a power to a power, multiply the exponents. Simply multiply the two exponents and you have your power raised to the other power. Rule: When the exponent of a power is zero, the value of the power is one. The value of the power will always result as one when the exponent is zero, unless the value is zero where it’s undefined. Frank had 100 dollars and spent 1/3 of his money on clothing. Nicole had 350 dollars and spent 1/7 of her money on clothing. Who spent the least amount of money? How much less did they pay compared with the other spending? Frank spent the least amount of money with $33.33 compared to Nicole’s $50.00. Frank spent $16.67 less than Nicole. Ou r world is slowly depending more and more on technology. We’re seeing many benefits, and we’re spending more and more time connected to the global web, exposing ourselves to the world. Everything we do can be tracked down to a file, and everything we’ve done our said is stored somewhere in the world. As we spend much more time connected, we need to learn how to properly implement it into our lives positively and efficiently. A digital footprint will be used to identify you from many people you may have not even met yet, such as your future employer, future friends, future teachers, future classmates and even the future of yourself. The identity of your online profile can influence the potential of your employment or even your relationships with friends or family. Adults have been losing their jobs as rivals dig through their digital footprint beginning from their teen years up to their adult years. For my generation, it’s completely different because we’ve grown on technology and everything we post from our childhoods will follow all the way up to the end of our lives. Looking through my online profile, going through to the footprints I leave on the internet surprised me when different comments appeared from YouTube, Instagram and different media sites where I spend my time tagging my friends or leaving feedback. It really proves that it’s not only our posts being found, but really everything we’re doing online is being tracked and kept somewhere. Most of your online footprint is controlled by yourself. You choose what goes out there, and it’s up to you to keep a clean and respectful digital footprint. To build your digital footprint, you need to be respectful online, respect others online, and make sure whatever you’re doing you can be proud of. Be sure to setup a Google Alert to notify yourself every time your name is mentioned online, go through your social media accounts’ privacy settings often and keep the content you put onto the internet clean. Although we’re being taught the exact same things every year about our digital footprints, we really need to wake up and face the harsh consequences there will be in the future. Parents need to know there needs to be less enforcement on the internet and instead have more education for kids to learn to be safe. I would definitely share the importance of keeping your profile on the internet and the security and professional risks there are. – Stop, Think, Stay Safe. Digital image. N.p., n.d. Web. 23 Sept. 2016. 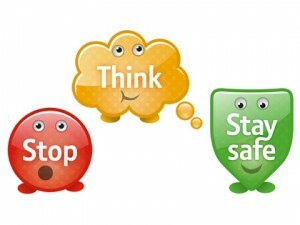 <http://msgeorgesmathclass.weebly.com/internet-safety.html>. 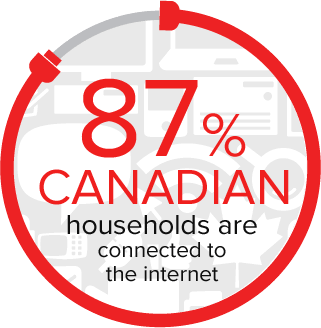 – 87% Canadian Families Connected To The Internet. Digital image. CIRA, n.d. Web. 23 Sept. 2016. <https://goo.gl/images/hF0k9r>. 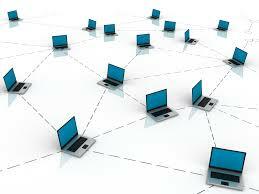 – Connected Computers. Digital image. N.p., n.d. Web. 23 Sept. 2016. <https://goo.gl/images/1Nmesw>. 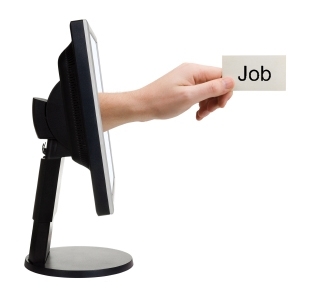 – Computer / Job. Digital image. N.p., n.d. Web. 23 Sept. 2016. <https://goo.gl/images/A4lAHN>. – “Be Smart On The Internet”. Digital image. N.p., n.d. Web. 23 Sept. 2016. <https://goo.gl/images/yEd5jn>. 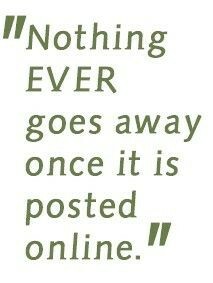 – “Nothing Ever Goes Away Once It’s On The Internet” Digital image. N.p., n.d. Web. 23 Sept. 2016. <https://goo.gl/images/yXR06n>.